In a series of 12 posts, I’ll make the case for Ubuntu as the platform of choice for public clouds, enterprise clouds and related scale-out initiatives. Cloud computing is largely being defined on public clouds today. There are a range of initiatives for private cloud computing – some proprietary, some open – but for sheer scale and traction, the game today is all about public cloud services. Azure, AWS, a range of offerings from telco’s and service providers together with innovative takes on the concept from hardware OEMs have been the leading edge of the cloud market for the past five years. We do expect private clouds to flourish around OpenStack, but we expect the gene pool of innovation to stay on the public clouds for some time. And what do people run on public clouds? By substantial majority, most of that innovation, most of that practical experience and most of the insights being generated are on Ubuntu. Ubuntu is the most popular OS on public clouds, by far. AWS hasn’t spoken publicly on the topic but there are a number of measurements by third parties that provide some insight. For example, SCALR offer a management service that is used by enterprises looking for more institutional management control of the way their teams use Amazon. 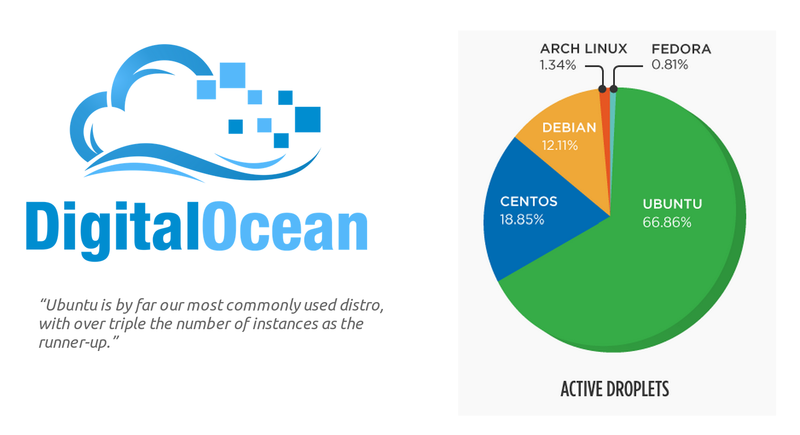 One might think that an enterprise management perspective would be skewed away from Ubuntu towards traditional, legacy enterprise Linux, but in fact they find that Ubuntu is more than 70% of all the images they see, three times as popular as CentOS. There is no true safety in numbers, but there is certainly reassurance. Using a platform that is being used by most other people means that the majority of the content you find about how to get things done efficiently is immediately relevant to you. Version skew – subtle differences in the versions of components that are available by default on your platform of choice – is much less of an issue if the guidebook you are reading assumes you’re on the same platform they used. There is also the question of talent – finding people to get amazing things done on the cloud is a lot easier if you let them use the platforms they have already grown comfortable with. They can be more productive, and there are many more of them around to hire. Talking to companies about cloud computing today it’s clear their biggest constraint is knowledge acquisition; the time it takes to grow own internal skills or to hire in the necessary skills to get the job done. Building on Ubuntu gives you a much broader talent and knowledge base to work with. Training your own team to use Ubuntu if they are familiar with another Linux is a relatively minor switch compared to the fundamental challenge of adopting a IAAS-based architecture. Switching to Ubuntu is the fastest way to tame that dragon, and the economics are great, too. That’s why we see many companies that have been doing Linux one way for a decade switching to Ubuntu when they switch to the cloud. Even if what they are doing on the cloud is essentially the same as something they already do on another platform, it’s “easier with Ubuntu on the cloud”, so they switch. With Bdale Garbee’s casting vote this week, the Debian technical committee finally settled the question of init for both Debian and Ubuntu in favour of systemd. I’d like to thank the committee for their thoughtful debate under pressure in the fishbowl; it set a high bar for analysis and experience-driven decision making since most members of the committee clearly took time to familiarise themselves with both options. I know the many people who work on Upstart appreciated the high praise for its code quality, rigorous testing and clarity of purpose expressed even by members who voted against it; from my perspective, it has been a pleasure to support the efforts of people who want to create truly great free software, and do it properly. Upstart has served Ubuntu extremely well – it gave us a great competitive advantage at a time when things became very dynamic in the kernel, it’s been very stable (it is after all the init used in both Ubuntu and RHEL 6 😉 and has set a high standard for Canonical-lead software quality of which I am proud. Nevertheless, the decision is for systemd, and given that Ubuntu is quite centrally a member of the Debian family, that’s a decision we support. I will ask members of the Ubuntu community to help to implement this decision efficiently, bringing systemd into both Debian and Ubuntu safely and expeditiously. It will no doubt take time to achieve the stability and coverage that we enjoy today and in 14.04 LTS with Upstart, but I will ask the Ubuntu tech board (many of whom do not work for Canonical) to review the position and map out appropriate transition plans. We’ll certainly complete work to make the new logind work without systemd as pid 1. I expect they will want to bring systemd into Ubuntu as an option for developers as soon as it is reliably available in Debian, and as our default as soon as it offers a credible quality of service to match the existing init. Technologies of choice evolve, and our platform evolves both to lead (today our focus is on the cloud and on mobile, and we are quite clearly leading GNU/Linux on both fronts) and to embrace change imposed elsewhere. Init is contentious because it is required for both developers and system administrators to understand its quirks and capabilities. No wonder this was a difficult debate, the consequences for hundreds of thousands of people are very high. From my perspective the fact that good people were clearly split suggests that either option would work perfectly well. I trust the new stewards of pid 1 will take that responsibility as seriously as the Upstart team has done, and be as pleasant to work with. And… onward.